Shaking up your thinking and being open to new ideas can be hard, particularly if know too much about a topic or have been doing something a certain way for a long time. So how can you forget what you know? Write down the half dozen or so core assumptions you make about a challenge you’re facing. Then write their opposites. Brainstorm what you could do if the opposites were true. Your logical mind may resist, but treat it as a game. Example: The usual assumption is that the way to make money from books, whether traditionally or self- published, is from royalties. The opposite: You are not allowed to make money from royalties. The brainstorm: What alternatives could there be? Attach the books to another product as a bonus. Provide them on a rental basis. Get people to fund them before you write them. Find a patron who will give you a flat rate for writing the book. Charge for giving talks and include the books in the price. ACTION: Try this with a challenge of yours. Consider how, when, where, and why things are usually done, and then the opposite of each of those and see where it leads you. The ideal age of the child to ask about what you should do probably is around five. Of course their answers will sound magical or impossible but treat them seriously and see what new ideas they might spark. The brainstorm: Hmm, where ARE your potential customers hiding? In other words, where does the conventional wisdom say they are not? Could they be there, but not obvious? Or is there a segment to which your product would appeal? ACTION: If you don’t have a child the right age, probably a friend or relative has one you could ask. Be sure to let the child know how much you appreciate his or her advice. What’s the main obstacle you face in solving a problem that’s bothering you? Consider how it could be turned into an advantage. Again, your logical mind probably will be inclined to snap shut, but play with the concept. Example: You have to finish a presentation in the next 48 hours but that’s not enough time. Brainstorm: People who don’t have much time need to be concise, or to move fast, or they have to get help. Concise: Can you use a different method of presentation that would be faster to produce—like mind maps? Your audience might appreciate a fresh delivery method. Move Fast: Could you use an existing set of materials and riff off those—e.g., here’s how this used to be done, let me contrast it with how we do things now. Collaborate: Can you get somebody else to do part of it? Or how about making the audience do part of the work? ACTION: Pinpoint your major obstacle and brainstorm how it could be your friend rather than your enemy. 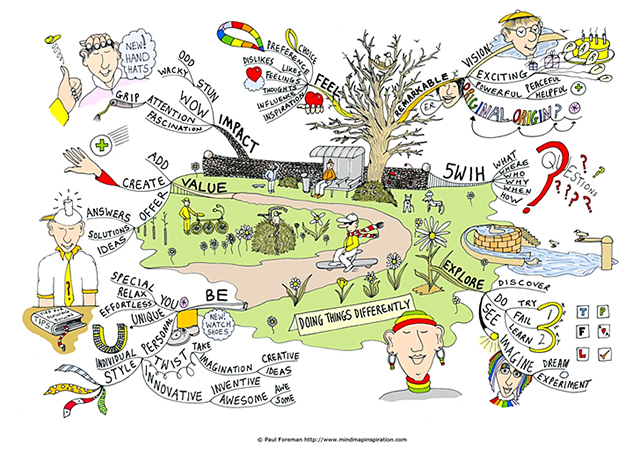 Mind maps are a powerful way of capturing your thoughts and bringing them to life in visual form. But more than that, they can also help to develop your thinking in new and unexpected ways, help you to solve problems more effectively and become more creative. ACTION: If you haven’t used the technique before, two starting points are the guides at Wikihow and Lifehacker. For some inspiration, here’s a mindmap about how to do things differently from mindmapinspiration.com. His recent books include “Creativity Now!” (Pearson), “Focus: the power of targeted thinking” (Pearson), “Do Something Different” (Virgin Business Books) and “Marketing for Entrepreneurs” (Pearson).